Liberator Rocket Heaters began as a family operation and continues as an all American business. We started the Research and Development process in 2012 and 3 years later, we pride ourselves in our accomplishment. We have a world's first: a successfully developed and manufactured, Nationally Recognized Testing Lab Tested and Listed to UL-1482 safety standards Rocket Heater. Our vision was inspired by many of the greatest entrepreneurs who came before us, from the Wright Brothers and Thomas Edison to Steve Jobs and Wozniak, and many others. Though we may never bear their rightfully earned legendary status, this operation began much like theirs. In an obscure and cramped one car garage filled way beyond capacity with machinery, we worked day and night to fulfill our vision: Develop an Affordable, Reliable, and Efficient source of heat from an appliance that's affordable to the common folk, using fuel that is readily available and with environmental considerations that fit the needs of the common people. Using the basic design principles found in the Rocket Mass Heater, a design wholly embraced by people who live a subsistence lifestyle around the world and combining these concepts with the best professional, scientific and engineering knowledge available, we re-engineered the heater of choice for permaculturalists, naturalists, homesteaders, and those who live off grid, from the ground up to meet the contemporary standards of excellence and quality demanded by modern science, industry, and the typical American customer at large. We use only the most advanced (and proprietary) manufacturing practices to provide you, the customer, with the world's most efficient wood stove. 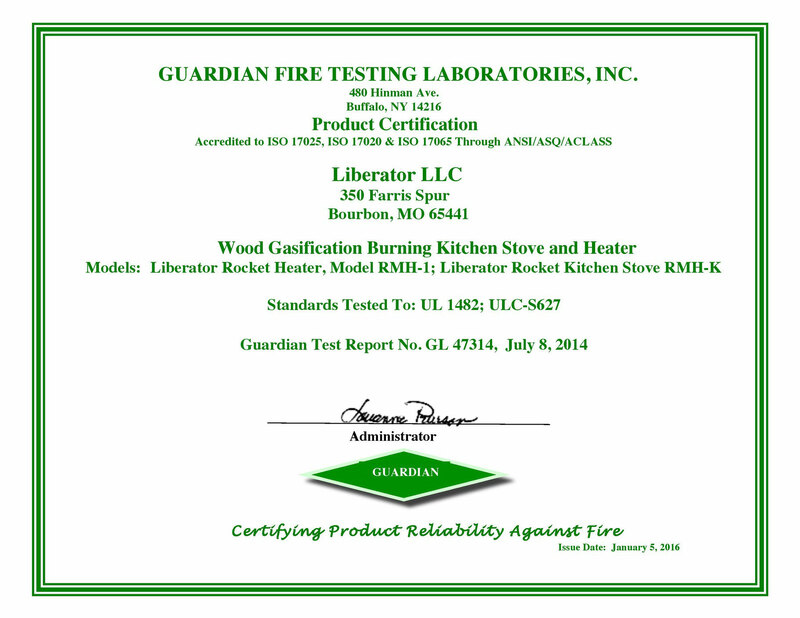 We pride ourselves in bringing to the world the only Rocket Heater that is Tested and Listed as having met the safety requirements outlined in UL-1482 by Guardian Firetesting Labs Inc. We also guarantee the highest quality stoves by having the factory they are manufactured in meet NRTL standards to ensure consistency and quality, and to provide you an extra margin of safety. To further assure that all our heaters are of the highest quality on the globe, we manufacture every piece of our heater domestically in the USA, under one roof, where all the processes can be overseen by everyone, including the Board and the Public, specifically in the heartland of America, where wood heat is a quintessential icon of the traditional Midwestern American culture of self reliance, independence from grid based energy, and self-determination. By manufacturing every piece here from only the finest stock of A36 Hot Rolled Steel, coming straight from American blast furnaces we ensure that the steel itself is of consistent strength and durability. By using the local industrial base available to us, you support jobs here at home (something that is still much needed) and also help protect the environment by not using dirty and environmentally irresponsible manufacturing methods. Of utmost importance to Liberator Rocket heaters is the assurance that comes from a product manufactured in the United States of America from local US materials. 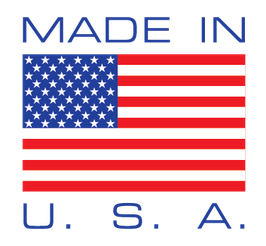 We know full well that "Made in USA" is and will remain the epitome in quality, performance, and longevity. When you invest in a Rocket Heater manufactured by Liberator Rocket Heaters, you not only invest in a highly efficient source of heat and the preservation of the environment for future generations, you also make an investment in local jobs to help combat poverty. But most importantly, you are investing in the peace of mind that comes from having self reliance from the often unreliable grid by heating your home with an often times FREE fuel. The fact that the fuel is free is itself an investment as the savings each month will dramatically reduce your heating bill, be it electric, gas, oil, propane, or other source, as you see the bill go down to as low as zero. The savings from this investment will pay for itself in less than two winters, depending on your current fuel and usage. Our techniques and facility have changed from the modest garage we started in to a state of the art factory. I can assure you that we are using the best technology available with the most up to date practices and procedures. This is assured by our NRTL Listing of both our rocket heater AND the factory that makes our heaters. 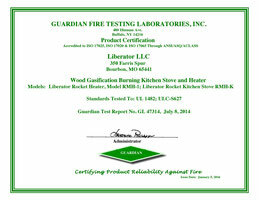 NRTL inspection by a third party lab insures quality, consistency and durability in every stove we produce. The Liberator Rocket Heater is truly a global milestone in wood and biomass heating technology, as previous designs are expensive and are often unsafe for use in conventional structures. Third party labs have demonstrated that Rocket Heaters are many times more energy efficient than any conventional wood stove and they are environmentally friendly because they use a renewable, sustainable, and pollution neutral fuel: small sticks, twigs, and staves. Liberator Rocket Heaters is also a family run business, and this father-son team oversees every aspect of this enterprise, so if you have a problem or question, you talk to us — directly. We take care in building each and every stove as though we were building it for ourselves (And in a sense we are)! We take that classic American work ethic and combine it with the most advanced methods and technology available to manufacture a stove that makes us, and we hope you, as a potential or existing owner, very proud indeed. If you have any questions, comments, or concerns, please feel free to Contact Us and download the Owners Manual in FAQ.